It’s always a happy surprise when I discover wonderful art in unexpected places. The poetry of Pablo Neruda was one of those discoveries for me, tucked into a rerun of a '90s era TV show that I watched every once in a while. I just so happened to catch an episode in which a character recited a few lines of a beautiful Neruda love poem. My interest piqued by that small excerpt, I was on a search to find the entire piece. Oddly enough, I don’t know that I’ve run across it yet, all these years later; by now, I‘ve forgotten the lines recited. It’s not important any more though. Lucky for me, someone writing an episode of a TV show was a fan of his work, and I was introduced to it in turn. Pablo Neruda was born in Chile in 1904, and had already become an accomplished poet by the time he was seventeen. In adulthood, he was appointed as a Chilean Consular and spent time in Asian countries. He also traveled to Spain, where he became friends with Spanish poets, including Frederico Garcia Lorca. When his friend Lorca was killed by Facist forces in the Spanish Civil War of 1936, Neruda was pulled into political activity. A decade later, back home in Chile in 1947, Neruda published a letter that accused the Chilean president of betrayal, and Neruda was forced to go into hiding because he was being pursued by the police. During this time in hiding, he wrote Canto General, one of his most celebrated pieces of work. In following years, he would travel, continue to write and eventually became a Chilean ambassador to Europe in 1971. It was that year that Neruda also won the Nobel Prize for Poetry. 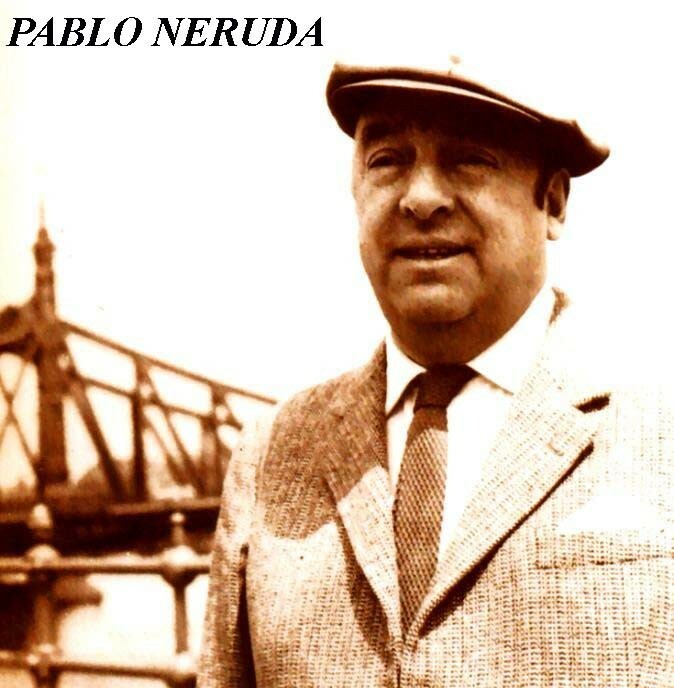 Not long after, having battled cancer, Neruda passed away in 1973. The one regret I have is that I’m not quite able to read Neruda in his own words. The volumes of his poetry that I have are the original Spanish, side by side with English translations. It’s torturous to be able to read just enough Spanish to know that certain lines aren’t translated exactly verbatim. This hasn’t stopped me from enjoying his poetry over the years though, and to keep going back to it like a visit to an old friend.